You’ve probably read the news by now about Corning’s latest innovation with Gorilla Glass 6, which is slated to continue helping future smartphones stay pristine, tip-top condition thanks to its improved drop resistant qualities! As you’re aware with all the trends of late, nearly all high-end phones employ a glass meets metal design. Many of them, in fact, leverage Corning’s Gorilla Glass because of its reputation of withstanding scratches, drops, and everything else that everyday life has to throw us. And there’s a reason why Corning’s glass is highly sought out amongst OEMs. 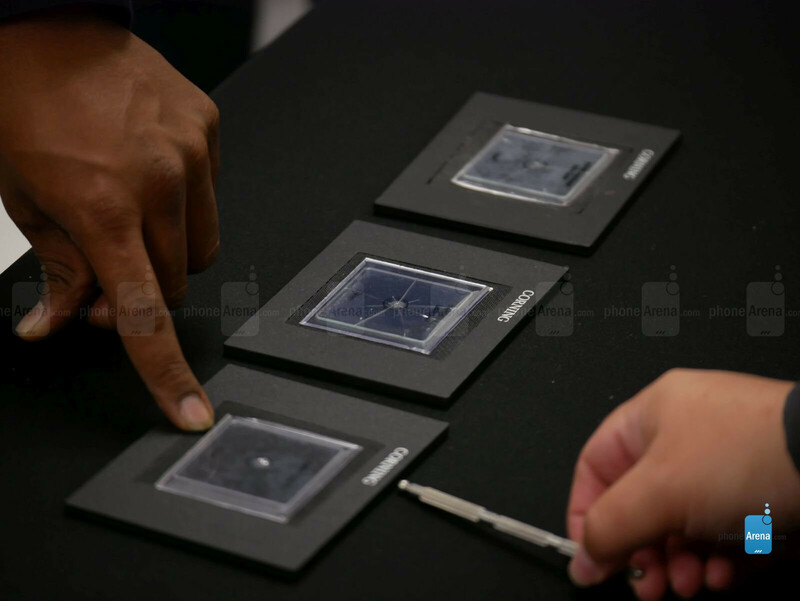 All of this brings us to a recent visit we had to Corning’s Technology Center in the heart of Silicon Valley, the site of its recent announcement for its new Gorilla Glass 6 – and also our opportunity to check out the behind the scenes look at its testing processes. This state-of-the-art applied research facility was interesting to say the least, as we got some insights into the intricacies of what goes into developing the next-generation Gorilla Glass. After spending a solid afternoon touring the facilities, we definitely came away significantly more educated about the properties of glass. We’ll quickly highlight some of the more intriguing aspects of the tour, but the next time you look at your phone and interact with it, you may be surprised by how much is involved with the glass that’s covering your device. It’s doing more than just protecting your phone! Being a manufacturer of glass, Corning places a ton of emphasis on testing out the durability and strength of its Gorilla Glass. Not surprisingly, they take pride in saying that Gorilla Glass is superior than other glass alternatives. When it comes to surviving drops and impacts, Corning puts its glass through some stringent testing to ensure they live up to the standards. Believe us when we say that they’re tasked to shatter glass! Throughout the various facilities we checked out during the tour, there were several machines and apparatuses that Corning employs to test out its glass. Most of them, however, are controlled tests that simulate real-world situations. Take for example the drop tower machine they use to simulate a phone falling from a certain height, where the phone impacts a rough surface. For Gorilla Glass 6, the company boldly claims that it offers twice the protection as its predecessor – and that the new glass can survive impacts 15 times over from a height of 1 meter (approximately 3.28 feet). Another apparatus has a giant steel ball going down a long tube, where at the bottom it impacted a piece of glass. For this test, they compared the difference between soda lime glass, which is typically the glass used for most windows, and one of Corning’s other new innovation in Gorilla Glass DX+ for wearables. This test, along with another one where we’re allowed to apply pressure using a pencil and a metal tool to crack the glass, shows us exactly how resilient Corning’s glass is compared to the competition. However, not everything is expected to last forever – so they all eventually succumb to being broken in some form or another. 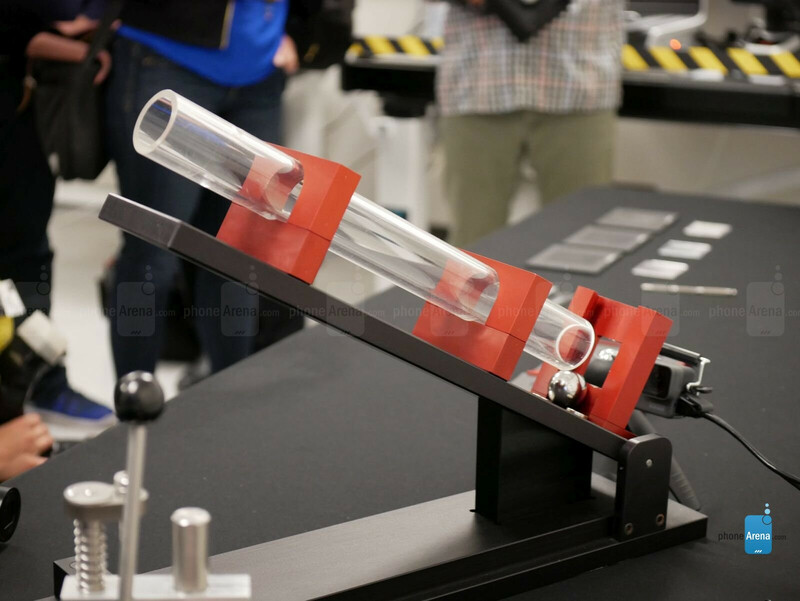 One of the many apparatuses used at Corning's testing facility to gather data about glass. One of the more profound revelations we had during the tour was understanding why can glass break unexpectedly in situations you’d think it’d survive. We’ve all at one point or another accidentally dropped our phones, only to be shocked in realizing that it somehow managed to survive the misfortune. Then there are other times when the glass shatters from very short heights, a very perplexing occurrence to tell you the truth. The tests performed at the facility are all controlled, which are conducted to try and match real-world situations. However, there are several other factors that can adversely affect the strength and durability of glass in general. In fact, it’s the microscopic imperfections that play into glass failing. Some of them you can see with your eyes, others are so faint and indistinct that you can’t see them, but every bump, knock, and minor drop is slowly diminishing the protective qualities of the glass. Throw in some outside forces, such as pressure, heat, or even chemicals, can wither away the strength of glass – subsequently causing it to fail. While these tests at its facilities are meant to provide valuable data, there’s always going to be those anomalies when glass fails unexpectedly. That’s just reality! Microscopic imperfections in glass are contributing factors to why glass can fail. Everyone knows what glass looks and feels like, it’s transparent and super smooth. In recent years, we’ve seen things like 2.5D and 3D glass, which indicates the curvature of the glass being employed – like the dual curved edges we find in phones like the Samsung Galaxy S9. Newer innovations are coming soon, as we were shown an assortment of new glass designs. We’ve already seen gradients and translucent glass in smartphones already, like the see-through back covering with the HTC U12+. Well, Corning intends on spreading the love by taking it further with some personalized glass options. 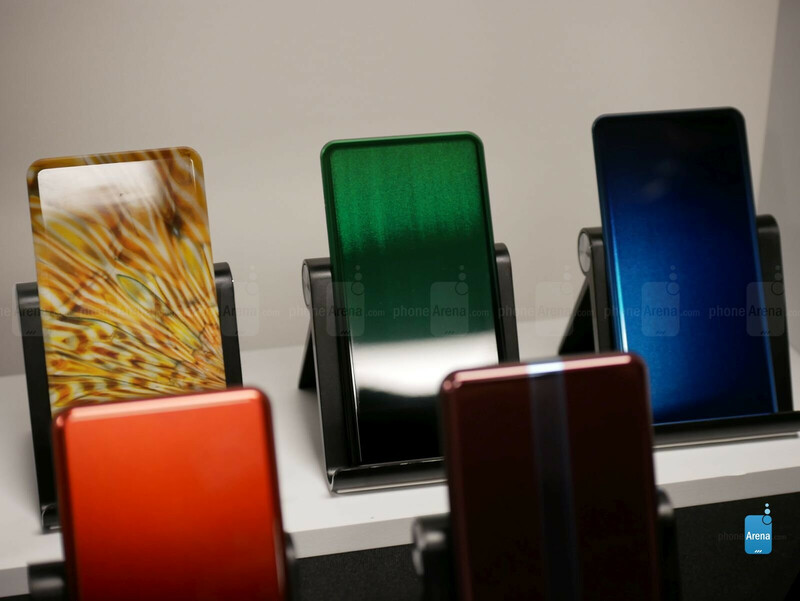 Although there aren’t definitive plans surrounding its “selective surface etching” on Vibrant Gorilla Glass that not only adds diversity in terms of color options, such as gradients, but also ones with texture through glass etching. It’s pretty remarkable to tell you the truth, especially after checking out several different options, such as one that emulates the feel of wood. Furthermore, this new inkjet technology they’ve developed allows them to generate any image – allowing for deeper personalization in the future. Out of all the things we checked out during the tour, this was no doubt the most fascinating because it’s going to offer significant variety to the look of today’s phones. In the past, we’ve seen personalization services like that of Moto Maker, but Corning’s technology will provide consumers and OEMs with variety on a larger scale. Corning's new inkjet technology allows them to print images on a piece of glass, with some offering unique textures to emulate the look and feel of real-life materials such as wood. New perspectives were opened to us after touring the facilities, giving us a new level of appreciation of how glass plays a crucial role in our gadgets. It’s not just there for protection, but it’s goes beyond that. Take for example wireless charging, something that’s become prevalent amongst phones in the last few years. If you’ve noticed, the phones today that offer the convenient feature leverage glass designs – whereby the rear of the phone is glass. You won’t find phones offering wireless charging with all-metal constructions. That’s because metal interferes with the electromagnetic field of the charging pad, but since glass is classified as a dielectric, it doesn’t have the same problem as metal. 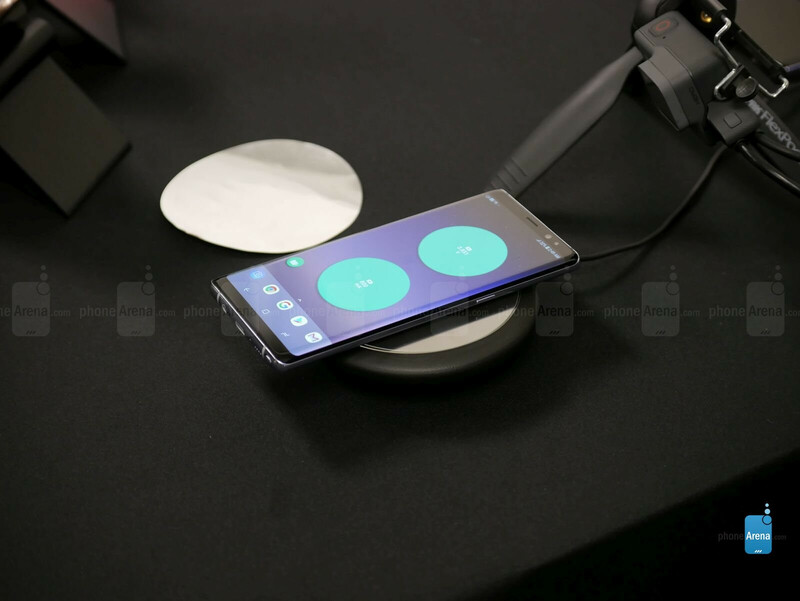 There's a reason why glass is essential in phones that offer wireless charging. It's considered a dielectric, which doesn't interfere with the electromagnetic fields. In a way, you can argue that the glass in our devices are underappreciated, since most people don’t realize the kind of work and thought that goes into it. Glass involves more than just the display we interact with on our phones, so we’re eager to see what other innovations we’ll see in the future. For Corning, though, they’ve shown us why they’re a market leader. Sure, we know that its Gorilla Glass offerings will only continue to become stronger, more resilient, and even skinnier, but it’s incredible to see that it goes significantly more beyond that. Maybe we’ll one day see a piece of glass that can bend? Anything’s possible at this point. Like the way how Corning is also giving attention to personalization. They should compare it to Gorilla Glass 5.